In this article, I want present you the concept of reflection, especially in JAVA world. In computer programming, reflection is the ability of a program to review and possibly modify, the internal structures of high-level (eg objects) at runtime. In OO programming, the reflection allows the introspection of classes i.e. loading a class, creation of an instance and access to the members (static or not), for example the methods’ calls, reading and writing of attributes without knowing the class in advance. Java has an API for reflection which is used mainly to manage extensions/plugins in an application. I invite you to read the Wikipedia definition http://en.wikipedia.org/wiki/Reflection_(computer_programming). While at first glance, the reflection appears to be reserved for a top-flight programming, but what are the cases of application of reflection? Use reflection to discovery of attributs of a object, to initialize its member variables or instanciate an object from its “definition” at runtime. For example, Spring framework whose the success demonstrates the viability of reflection in this use case. Use reflection to write a generic code generator for a set of classes (like JAXB-XJC). Automatically process the content objects. For example, to display all informations of an object in a page automatically (ie without access to all fields of the object), the use of reflection can be very handy and save a lot time. Indeed, by browsing the contents of an object by reflection, in a nutshell, any structural modification of the object (such as adding a field in the object) is automatically passed effortlessly to all points using this object. The dynamic programming of reflection allows to ignore the content of classes and write generic code that can handle any class. This type of programming is typically used by IDEs in the aid in programming or code completion without building of a bank of informations concerning the definition of used services. Reflection is used in the serialization process in the calls and exchanges on networks. …in the development of logging tools, in the SQL script generation for the persistence of an object…etc. 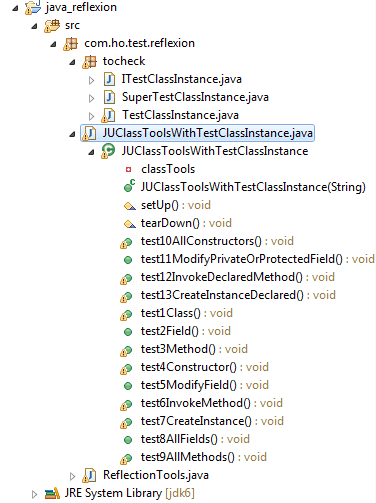 public final class java.lang.String extends java.lang.Object implements java.io. So, the methods “getField”, “getFields”, “getMethod” and “getMethods” allow the retrieve the publics fields and methods. However, there are others methods named “getDeclaredFields” and “getDeclaredMethods” which give the possibilities to violate the rules of encapsulation, in being able to see the characteristics of private, protected fields and methods. The Reflection API allows thus, the virtual machine to be able to explore all elements of a class, but especially the necessity to dispose of all meta data in order to detect errors in running. By calling the setAcessible(true) method on Field or Method objects, the access checks are turned off for the particular Field or Method instance, for reflection only. So, the access of private, protected or package scoped fields or methods are possible, and even, its value can be modified. // Important Note: unlike "getFields" and "getMethods" methods, the methods "getDeclaredFields" and "getDeclaredMethods"
// do not return the information inherited. In this case, it is necessary to go ask the parent class.